In the last 20 years, copyright policy has been a core item on the national and international agenda. The rise of online piracy especially has highlighted the importance of consistent cross-country protection and triggered a flurry of legislative and harmonisation efforts at the national and international level (among others: the Agreement on Trade Related Aspects of Intellectual Property Rights (TRIPs), the EU and the North American Free Trade Agreement (NAFTA). However, inconsistencies between countries remain and their impact on other policy areas is profound, for example the Google Book Library Project. Responses to new challenges like digitisation are largely determined by a country’s general understanding of copyright: its legal culture. The literature identifies a number of common factors that have triggered increasing similarity between national policies. Firstly, copyright is an inherently international issue. Copyrighted works have always been transported and traded across borders. As a result, there have been strong pressures in ‘copyright exporting’ countries to ensure adequate protection in other systems. There have been a large number of agreements over the years aiming to ensure a minimum standard of protection in all member states, for example the Berne Convention (1886 and its revisions) and the TRIPs agreement (1994). These agreements, however (especially early ones), were not intended to cause convergence. Rather, the aim was to provide for national treatment and minimum standards amongst countries. Nonetheless, they do contribute to convergence in practice because they bridge the systematic differences between different copyright conceptions. The strongest influence in this respect is attributed to the Berne Convention. Convergence here is the result of spreading certain copyright features, for example requiring that member states ensure a minimum term of protection (life plus fifty years) and the protection of moral rights. Another multilateral framework for coordination is provided by the EU. The EU has member states from both legal families and this is reflected in its copyright provisions which includes cultural features from both groups. The effectiveness of EU attempts at convergence is considered particularly strong because of its enforcement capabilities. The domestic pressure for international protection can also lead to unilateral action. The US especially has pushed for further protection at both the international level and third countries’ national legislation. In doing so, it actively aimed to have its own approach implemented at the international level. One key example here is the explicit exclusion of moral rights from the TRIPs agreement. Finally, new technologies challenge copyright by creating loopholes and therefore triggering a regulatory response. In an environment characterised by significant international communication, these responses are expected to be similar. As countries discuss the issues, and especially the possible solutions, at the international level, these ideas spread from one country to the next and enter the domestic debates. This naturally increases the likelihood of jurisdictions adopting similar approaches to challenges. As a result of these forces, commentators refer to a convergence in copyright policy. This is either assumed or argued in reference to the literature on copyright law in (comparative) legal studies. The methodologies used vary and range from traditional doctrinal legal analysis to statistical analyses. However, there is disagreement on the extent of convergence. Those focusing on the actual provisions, rather than functional equivalence, have identified growing similarities as systems move towards each other. In this respect, cultural variations are seen as historical artefacts. However, there is no claim that convergence has been complete. They especially point out that full convergence may be impossible as the remaining variations have high political salience: they affect core cultural differences. On the other hand, the functional school of thought argues that these remaining discrepancies, on the surface, do not prevent full functional convergence. The systems lead to the same outcome despite the different approaches used. In this sense, the variations are seen as very minor. They do not affect the substance of protection and are too small to be of systematic relevance. The systems have moved closer to each other: they agree on the appropriate protection although the means to achieve this vary. In conclusion, the literature disputes the extent of convergence but the evidence is limited. Depending on the school of thought, the impact of the remaining differences varies between irrelevance and representing core cultural assumptions. In either case, copyright policies have become more similar over time as the systems move towards each other. However, recent developments contradict the literature, as the impact of the differences is extensive and highly significant. For example, the varying responses to major undertakings, such as the Google Book project, demonstrate that the solutions to technological challenges still vary both in form and substance. Since 2004, Google has digitised complete books to make them at least partially available online – irrespective of their copyright status and without the explicit consent of the copyright holders. Although this practice of digitisation has been permissible in the US, it has been considered infringing in the EU. However, the resulting European digitisation alternative, Europeana, has only made slow progress with strong variations in development between member states due to the differences in digitisation exemptions for archival purposes and the procedures for making these available online. Therefore, a longitudinal study, utilising a more systematic and objective approach to examine the evolution of copyright across countries is required to shed light on this contradiction. This study investigates convergence from the point of view of four case studies. These case studies comprise of three countries (the UK, Germany and the US) and the international law dimension. These case studies were selected for their cultural background as well as their economic strength. The UK and Germany are the economic powerhouses in the EU. Germany is a civil law country while the UK’s copyright system is based on common law: they belong to different legal cultures. It should be noted that France is often used instead of Germany as the ideal civil law country in the field of copyright policy. France’s role in these comparisons is that of a benchmark because it is seen as the most representative case study for the civil law approach to copyright. However, research has shown that France has never fully met this standard: it has never adopted a pure civil law approach. As a result, this article relies on a theory-based ideal type to provide the standard of comparison. In addition, the discourse on copyright is dominated by economic concerns, for example copyright as a major contribution to a country’s competitiveness and economic growth. Therefore, the economically stronger Germany is chosen instead of France. The US is included for its economic strength and to isolate the influence of EU membership. Finally, given the importance of the international dimension, the different multilateral agreements are treated as a distinct system by aggregating the individual provisions. In essence, it represents a kind of ‘super-agreement’ reflecting the strongest level of protection possible at the international level that a state would benefit from if it joined all of these agreements. The time frame covers 1880-2010 and the state of the provisions are determined for every 10 years. The long time frame is necessary to isolate the influence of international coordination, especially the 1886 Berne Convention. The focal point of the study is the state of the law as it is in force. The data set is therefore made up of the statutes, case law and contemporary interpretations of these. By relying on these three types of sources, the law for each time frame is assessed comprehensively. However, the data does not include such areas as contractual provisions or collecting societies among others. The focus is instead on the core areas of copyright. The next section will outline what copyright is and describe two ideal copyright types. The discussion will then move in section three to clarify how these ideal types can be used to measure convergence. Section four presents the results of the analysis, focusing particularly on instances of convergence. The final section will compare these findings with the positions taken in the literature. Policies evolve over time. One concept used to map these kinds of spatial developments is convergence. There is a large body of literature analysing the growing similarity between policies over time, drawn from all areas of policy-making and law. Today, it is generally accepted that convergence refers to the growing similarity over time in respect to a specific policy or institutional design. Three aspects are clear from looking at this definition. First, the temporal dimension is of key importance: convergence describes a process over time and an outcome. Secondly, it focuses on a movement in substantive terms. Some aspect of the policy is moving across a perceived policy space. Thirdly, the term similarity is inherently vague. This means that the policy options and variations have to be defined. To illustrate what these characteristics mean, let us assume that a policy can have three distinct instruments (A, B and C) in response to an issue. This is the defined policy space. At the first time point, country X uses instrument A while country Y prefers C. Over time (the second time point), both countries change their position and adopt instrument B instead. By amending their law, both of them have changed position in the defined policy space and have moved closer to each other. In summary, convergence is a two-dimensional concept, in which a method must be found to consistently map changes across space over time. To understand the policy space in copyright, it is necessary to understand its major components. Copyright distinguishes between the three categories of works that it protects. The first group focuses on copyrighted works in the traditional sense (hereinafter “CR”). These are protected on the basis of their minimum originality. Examples include literary works, music and art. The second category contains neighbouring rights (hereinafter “NR”). These works are by definition not original and are instead protected because of their economic importance to exploiting a copyrighted work. The core NR are sound recordings and broadcasts. Finally, the third group are performances. Here protection is granted to the actual performance of a work-based on its fixation in a tangible form and further use. The distinct shape of a copyright policy is determined by a number of characteristics. These features centre on two main areas: the protection of the work (its economic value) and the protection of the author. The combination of economic and author protection, and especially the relationship between them, varies across cultures and can be used to measure convergence in spatial terms. Economic protection focuses on what is considered a work and how is it protected from unauthorised exploitation. In this area, the distinction is between the copyright owners and the users. First of all, not everything automatically constitutes a work. For CR works, the demarcation is usually drawn on the basis of originality: a minimum threshold must be met. However, NR works and performances do not require such a threshold. Furthermore, once the work is recognised as ‘copyrightable’, other hurdles must be examined, for instance, do any additional formalities have to be complied with in order to secure protection, for example registration or the © symbol? If the work actually benefits from copyright, the focus moves to how strong the protection is and who owns the rights. The relevant features are what kinds of uses need authorisation by the rights owners (economic rights) and which are explicitly exempt (exemptions). In addition, the term of protection and enforcement capabilities (sanctions) also influence the strength of protection. In summary, the first component of copyright policy describes who can benefit, from what kind of protection, in which circumstances. The second core aspect of copyright policy concerns the relationship between the author and his work. This refers to the authors’ special rights that only he has, and the circumstances under which he can enforce them. This includes specific rights available (moral rights, hereinafter “MR”), the kind of works they apply to, the situations in which they cannot be relied upon (exemptions) as well as the available enforcement capabilities (sanctions). These rights limit the extent to which an author can assign copyright and potentially interfere with the economic exploitability of a work. Therefore, the opposing interested groups in cases of assignment are the copyright owners against the authors of works. In conclusion, the second component of copyright policy emphasises the author’s ability to limit the exploitation of their work. All of these features described above play a significant role in determining the shape of a copyright policy. As a result, this study uses them as indicators later on in the methodology. To examine cultural similarity, a method to identify and conceptualise the differences between copyright systems must be developed. One approach to order the spatial features of copyright (legal culture) is to rely on the theory of legal origin. It distinguishes between two copyright systems in the West: author’s rights systems (“AR”) and common law systems (“CL”). AR is the civil law approach to copyright and prevalent on the European continent. Important examples include Germany and France. CL systems reflect the common law countries’ understanding of copyright. Two major representatives of this system are the US and the UK. The basic difference between these two systems is how they conceptualise the purpose of copyright: why protection is granted. In common law countries, copyright is based on a mix of two rationales: Utilitarianism and Labour. Utilitarianism provides that protection is granted to ensure that works are created and published. The incentives provided are in the public’s best interest as it facilitates the dissemination of works. In addition, the author deserves protection. This reasoning is based on an interpretation of Locke’s Theory of Labour. The individual uses his resources in the creation of the work and therefore has a right to control it. On the other hand, AR countries protect the personality of the author, which is imprinted on the work. It is therefore not perceived as an incentive to create to benefit the public good, but to protect the author as such. This difference in rationale affects other core copyright features. Ideal type CL systems emphasise the incentive to disseminate by focusing on the economic exploitability of the work. As a result, rights are owned by the investor; this favours employers over authors because they benefit from the protection and therefore the value of the work. Moral rights to protect the author against these investors are largely absent. Furthermore, any work of value to the public is included. This in turns means that the originality threshold is low and technological works are included, for example sound recordings. At the same time, formalities are considered essential to prevent excessive protection, which has no public value. In addition, protection is not granted to foreigners since their incentive is determined domestically. Economic rights and enforcement provisions designed to benefit the copyright owner are limited to the extent necessary for the dissemination incentive to work. In turn, the exemptions for public benefit uses, for example teaching and libraries are extensive. In ideal AR systems, the focus is on the author’s personality, which is indistinguishable from the work. His works only benefit from protection if they reflect his personality, necessitating a high originality threshold. This excludes protection for works that are only economically relevant, but not in terms of creativity (NR). At the same time, formalities are absent and protection is also extended to foreigners – the personality does not depend on administrative procedures or citizenship. Since there is no inherent public benefit justification and copyright protection is viewed as a right rather than a grant, economic rights are extensive and the exemptions very limited. Furthermore, they tend to include some kind of remuneration for the author. Finally, the investor is in a weak position as strong MR and primary ownership rules both benefit the author at the expense of an investor. The section summarised the two different approaches to copyright: AR and CL. Based on these descriptions, eleven distinct areas or dimensions can be identified in which these two systems are expected to vary. Therefore, each of these dimensions reflects an established difference between AR and CL systems. These dimensions are set out in the table below. For example, AR and CL systems vary significantly on the level of originality required for protection. The order of the individual components in the legislation. The kind of rationales that can be identified from the legal provisions. The threshold for CR works to qualify for protection. What component of the work is protected? This ranges from the physical object to the author’s personality. The protection of economic exploitability (ER) in comparison to the protection of the author (MR). Who is favoured by the first ownership rules as they are assumed to have ownership of any rights from the moment a work is created at the expense of the other party (the author v the employer). The strength of economic rights granted to the copyright owner in comparison to the exemptions for the public benefit. The strength of NR protection in comparison to CR works. The number of formalities and their impact on the existence and enforceability of copyright. The extent to which foreigners benefit from protection in comparison to nationals. The extent to which copyright legislation limits the assignability of rights in an effort to protect the author against bargaining inequalities. Table 1: The individual dimensions describing the systematic differences between AR and CL copyright systems. Although these differences clearly establish two distinct copyright systems in their ideal form, they are too vague to be quantifiable. Therefore, specific indicators need to be selected for each of these individual dimensions. The term ‘indicators’ here refers to those identifable features of a policy that determine its characteristics, as describes in sections 2.1 and 2.2. For example, the “Emphasis of Protection” refers to the comparative strength between economic and moral rights. This means that the features defining both areas have to be combined. To determine the strength of economic provisions, it is first necessary to identify how a work can benefit from protection. In terms of indicators, the number of work types in combination with the number and impact of formalities provides this information. In addition, the strength of economic protection also depends on the substantive strength of the provisions. This can be assesed by using the number of economic rights, their term of protection, the exemptions which apply to them (both the number and average number of conditions) and the number of sanctions for economic works must be considered. For moral rights, their number, term of protection, applicable exemptions and sanctions are relevant. It should be noted that the terminology of provisions varies across countries. As a result, to actually establish the strength of any one indicator, a coherent set of definitions needs to be applied. In this study, the legal provisions were identified and coded by using very precise definitions based on the narrowest possible definition in an effort to reduce this ambiguity. By applying one common standard, all indicators are directly comparable across countries. The make-up of the eleven dimensions can be seen in Table 2. It lists all of the relevant indicators used in this study and identifies the specific dimension they contribute to. This means that for each of the 11 differences between the AR and CL systems (dimensions), the information necessary to give substance to it (indicators) is shown in the table. Therefore the table provides an overview of the dimensions and their specific content at the indicator level. At this stage, all of the relevant indicators have been identified and linked to the dimensions for which they are relevant. However, the indicators only become meaningful once they are directly linked to the two ideal types of copyright systems. This is done by utilising a spectrum. On this spectrum, the ideal type CL and AR represent the extreme ends. These ideal types are embodiments of a theoretical system rather than the description of existing laws (Table 3). This approach is commonly used in the social sciences to systematically map out a policy space. The centre point denotes the neutral stage defined as exhibiting even mix of both AR and CL characteristics. It is the indicators’ mean which gives the score for the particular dimension. Figure 1: Spectrum design showing the position of the ideal AR and CL types. Table 3 below summarises the specific characteristics a system will exhibit for each position on this spectrum and for each of the 11 differences previously identified between CL and AR systems. As mentioned before, the specific content for each spectrum position depends on the indicators in Table 2. Table 3: Classification table for the individual dimensions that define a copyright system. It should be noted at this point that culture is not the same as a policy’s strength of protection. Although both can be measured with the same indicators, the strength of protection relies on the actual value of these indicators to convey the information required. On the other hand, in the cultural analysis, it is the relationship between indicators that provides the information. For example, the scope of protection for NR includes the number of rights, exemptions and sanctions among others. However, in terms of culture, the question is if NR protection is weaker or at the same level compared to the protection of CR. Therefore, it is necessary to control for the developments in the scope of protection over time in the cultural analysis. To do this, the cultural dimensions rely on relative terms such as ‘weak’ and ‘strong’ (see Table 3). These terms in turn are linked in substance to the maximum value of the specific indicator, at a particular the point of time. On the basis of this maximum value, the terms were given the meanings ascribed in Table 4. For example, if case study A was to provide 2 MR and while the strongest provision in the sample was 5 MR, then its provisions would be classified as weak (40%). In sum, Table 4 provides the overview of the percentage range equivalents for each of the relative terms found in the indicator descriptions. Table 4: The link between maximum provisions and the relative terms used to describe copyright provisions. However, the actual relation of the indicator to the spectrum depends on the indicator in question. For example, strong MR are indicative of the AR system. Therefore, very strong provisions would be classified as 5 (equalling ideal AR systems) while limited provisions are classified as a 1 (equalling ideal CL systems). For example, a large number of economic rights exemptions are in line with the CL copyright approach. As a result, strong provisions score a 1 and limited provisions a 5. The classification of an indicator therefore depends on the specific indicator and how it relates to the differences between AR and CL system. Table 2 has provided a list of the individual dimensions and the specific indicators they rely on. The table distinguishes between those representative of the CL ideal type: high values score a 1. On the other hand, extensive provisions for those linked to AR systems score a 5. This classification process was repeated for every indicator and then used in the calculation. For example, the “Scope of Protection” is a balance between the rights given to the owner and those of the users. The owner benefits from the number of work types, the number of economic rights, sanctions and term of protection as well as ownership rules for both CR and NR works. On the other hand, the formalities and exemptions benefit the user. The number of conditions here works against the users and in favour of the owners because they restrict the scope of exemptions. All of these indicators are combined in the form of the 1 to 5 scores. In summary, examining copyright systems according to the ideal types allows for a systematic examination of their cultural approach in practice. This examination is strengthened by the consistent coding across case studies, which makes all the information directly comparable across countries. The results of this approach provide quantitative evidence on the nature of a particular country’s copyright policy, how it relates to the ideal type and to the other countries examined. The main benefit is that the extent of developments is directly comparable. This means that the different arguments on the extent of cultural convergence can be examined using this evidence and conclusions on their accuracy can be drawn. The following section will demonstrate that there has been no unifying trend across time or across case studies. Germany moved strongly in the direction of its ideal type between 1880- 2000 and only experienced very limited movement towards the centre since then. On the other hand, the UK and the international level shifted closer to AR by 1950 but reversed the trend since then. Today both are slightly CL in character (scores below 3) and located very close together. Currently, the US is also positioned in close proximity to the UK and international level. However, it has seen no comparative shift towards AR in its history. It should be noted that the countries featured in the case studies are still attracted to their respective ideal types. Germany scores above 3 and therefore leans towards AR while the US and the UK both are closer to CL (as their positions are below 3). Germany has experienced an extensive shift towards AR. It saw a strong increase early in the time frame demonstrated by the change of its score from 3.1 in 1880 to 4.2 in 2000. The trend only reversed after 2000. At this time, Germany’s position fell from 4.2 to 4.1. The international level also moved in the direction of AR early on. The score shifted upwards from 3.5 (1890) to 3.7 (1950) in a largely continuous movement. However, the trend was reversed by 1970, as the score fell from 3.7 to 2.9. This is the sharpest fall within the case studies included in the case study sample. From this time onwards, the international level remained largely stable (between 2.8 and 2.9). Figure 2: The evolution of copyright policies in Germany, the US, the UK and the (aggregated) international level in comparison to ideal type AR and CL systems. As for the UK, it experienced an early shift away from its ideal type (CL). The score increased from 2.5 in 1880 to 2.8 in 1950. However, like the international level, its position moved towards CL, to 2.4 by 1990, representing a marked shift in character. The direction of evolution changed again post-1990: the UK’s results now increased to 2.7 in 2010. The US, on the other hand, experienced a move to its ideal type (from 2.1 in 1880 to 1.9 in 1980). After 1980, the trend changed as the US saw an upward shift in position: to 2.4 in 1990. This trend continued as the scores increased to 2.7 by 2010. These results clearly demonstrate that the trends have neither been even nor consistent across time or case studies. It is therefore necessary to examine when exactly the countries/international law featured in the case studies have actually converged. This is done by directly comparing these case studies with each other. The following section will demonstrate that within the larger pattern of changing trends, some instances of convergence are observable. However, although the overall positions have moved towards each other, this is not necessarily true for the individual dimensions. It is interesting to see that there have been no changes to the legislation during the World Wars or crises in the late 1930s. Germany’s final amendment was a change in terms in 1933, whereby legislative activity only resumed after 1950. Similarly, the US saw no changes in the 1930s and only a codification of existing legislation in 1948. The UK also did not amend its legislation between 1930 and 1950: its first legislative action was the 1956 reform. Finally, the international level saw no revisions between the 1928 Rome and the 1948 Brussels revisions. This pattern indicates that copyright is relegated to the back seat if more pressing concerns are on the agenda: especially severe economic crisis or war. Copyright is essentially a peacetime issue, which plays virtually no role in circumstances of substantial crisis. Overall convergence is limited to the UK, US and the international level. The distance between all three case studies fell between 1890 and 2010: from 0.1 to 0 between the US and the UK, 1.4 to 0.2 between the US and the international level and 1.3 to 0.2 between the UK and the international level. However, this description hides two important characteristics of the evolution. First, the convergences have not been continuous. Instead, the differences between the individual case studies have varied significantly over time. For example, the maximum divergence between the US and the UK is 0.9 (1960). 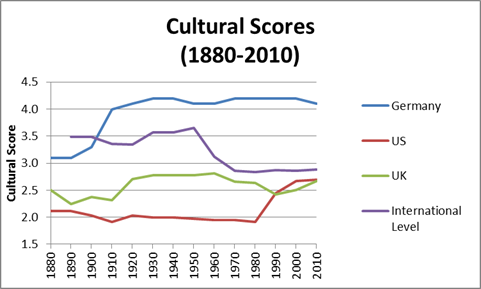 The second aspect is that although the overall cultural scores are comparatively closer together by 2010, there remains significant variation between the individual dimensions. One way to measure the inter-dimensional variation is the Coefficient of Variation (CV). It provides an image of the distributional spread, by describing the distances between a value and the overall mean. The CV has the benefit of being independent from the underlying values and is therefore directly comparable across case study combinations. The scores for the three case studies combined fell from 0.53 in 1880 to 0.31 in 2010. This means that the variation fell by 41%. The overall cultural distance declined from 1.2 to 0.2 and therefore 83%. In conclusion, case studies have converged in their overall cultural position but less extensively in the individual components. The approach to specific issues such as NR protection continues to vary. It is noticeable that the pattern observed in terms of convergence and divergence is more varied than suggested in the literature. Therefore, this section will compare the patterns observed with influences outlined in the literature. The analysis has demonstrated that copyright features must be seen in context. Much of the literature argues that policies have converged because a particular feature has been adopted. However, the evidence here shows that such a focus is too narrow. For example, the US introduced protection for foreigners in the 1891 Chace Act. Generally, this kind of protection is an indicator for AR and should therefore have triggered an increase in score. However, the protection was subject to extensive, onerous formalities that have to be met to gain copyright protection: this limited its practical application. As a result, the systematic score actually fell from 2.22 (1890) to 2.04 in 1900. Therefore, the approach to copyright can only be determined by taking all influences on an issue into account. There is an important difference between looking at copyright provisions in combination and focusing only on their substance. This confirms that it is not sufficient to identify the overall similarity because it hides the continued differences at the dimensional level. However this distinction is only possible because the policy space was systematically mapped out. By identifying the eleven dimensions on which the ideal types vary, the differences between AR and CL were given substance. This in turn enhanced the detail of the analysis, showing a more precise image of the convergence pattern without losing sight of the larger picture. The literature highlights the importance of technology in moulding copyright approaches. The countries examined here are at similar stages in their economic development and therefore face similar social and economic issues. This is also the case for the aggregated international dimension because it has been continuously updated to reflect new developments and changes in attitudes among its member states, for example in the 1961 Rome Convention or TRIPs in 1994. This pressure from similar issues is especially relevant in relation to technological innovation because these cross national borders, necessitating a response in all case studies. Goldstein and Hugenholtz argue that these innovations create economic pressures to begin protecting technological works under the copyright umbrella. This has created convergence because the understanding of copyright changes as result. Drexl clarifies that new technologies are recognised for their economic importance and not the traditional originality criterion. By moving away from the originality requirement, AR countries especially shift away from their principled stances represented in the ideal types. In practice these arguments mean that the protection of new technologies causes a cultural convergence because what is protected is intrinsically linked to the underlying justifications on which copyright protection is based, and therefore the fundamental difference between the ideal types examined here. To examine the impact of technology, the case of NR will be used. The ideal types used here vary most clearly on the protection of NR and therefore change is most likely observed in these areas. In theory, the protection of NR will cause a move closer to CL. As a result, convergence here would the result of all case studies moving in the same direction. The evidence here indicates that responding to new technologies has not triggered convergence. The introduction of NR has not caused systematic change in the approach to copyright policy. The German 1965 copyright reform did not bring a CL style systematic impact as the score actually increased from 4.1 to 4.2. The explanation is that although NR were introduced, their status was inferior and the CR and MR protection was expanded. Similarly, the UK’s introduction of NR in its 1956 Copyright Act also did not lead to a systematic reassessment of copyright policy. Its score remained stable at 2.8. The same applies to the US (stable at 2 to 1.9) and the international level (3.1 to 2.9). In summary there is no evidence that responding to technological innovation by expanding protection has triggered cultural convergence. The literature highlighted the role of three individual actors as converging forces: the international level, the US and the EU. If an actor has been influential, he will push for legislation which mirrors his own. In this sense, his own policy preference will be reflected in that of the influenced case study. The results provide some evidence that the international level has influenced national legislation. International coordination had a shaping influence on the actual terms of protection, although this seems to be limited to core provisions. The pressure is only strong enough to trigger substantive change in areas where non-compliance is easily detected. For example, the UK converged with the international level between 1920 and 1930 as the distance between them fell from 1 to 0.6. The UK saw rising scores (from 2.3 to 2.7) while the international level’s fell (3.4 to 3.3). The national treatment prescribed by the Berne Convention strongly favours the absence of formalities for national works as well. As a result, the consensus on formalities and the adequate level of protection for foreigners had changed by 1910. Most notably, these changes caused two convergences: the distance in the Formalities dimension fell from 2.5 to 0 and Protection of Foreigners from 2 to 0. This example shows how the expectations represented by the international level have affected a member state. Nonetheless, the Berne Convention did not actually determine the timing of reform. There is a significant time lag between the Berne Convention and subsequent changes in national copyright policy in the earlier parts of the study. For example, the Berne Convention was concluded in 1886, however, the UK’s reforms with systematic impact did not occur until 1911. However, it should be noted that copyright reform in the UK was on the agenda for decades, for example the 1878 Royal Commission Report. Therefore, although international compliance pressures undoubtedly increased after the 1908 Berlin revision, the reforms were timed by domestic and not international factors. In addition, the international influence is significantly more limited if it requires the introduction of new protection. In response to membership, the US abolished its constitutive formalities and introduced MR. The influence on formalities was akin the situation in the UK: formalities were abolished because non-compliance is easily detected. However, the protection of MR gave the US more leeway. While it introduced a significant number of new rights, it also introduced a large number of MR exemptions (the indicator fell from 5 to 1). The Berne Convention is largely silent in this area. The US therefore undermined the strength of MR without affecting its compliance with the Berne Convention. In sum, the influence of the international level is limited to those areas where compliance can be easily verified and thus, mainly explicit prohibitions. Furthermore, the influence the international level has on the convergence between its member states is also limited. On one hand, Germany and the UK have both been long-standing members of the Berne Convention – the strongest copyright convention in Europe. Both countries also participate in the Universal Copyright Convention (UCC) and the Rome Convention among others. However, their cultural evolutions are nearly polar opposites. They have strongly diverged between 1890 and 2010 as the distance between them increased from 0.6 to 1.4. On the other hand, both the UK and Germany have converged with the US between 1980 and 1990. The distances fell from 2.3 to 2.8 and 0.7 to 0 respectively. Much of the change can be explained by the US’ systematic change, especially its amendments to the dimensions of “Formalities” and the “Protection of Foreigners”. Both of these changes are a reflection of the amendments made in order to comply with the Berne provisions. Therefore, it was the Berne Convention that made the US shift towards AR. This in turn brought it closer to the UK and Germany. It is therefore possible that although the Berne Convention has no direct effect on long- term members, it moves newer member states closer to existing ones. In conclusion, the impact of international coordination varies. On one hand, the international level can shape member state legislation if reforms are required to prevent obvious non- compliance. However, the influence is narrow and limited to positive protection – the introduction of rights, as the US example demonstrated. Furthermore, the pressure is not strong enough to require immediate action, especially early on in the timeframe when domestic reforms were delayed by decades. It therefore does not determine the timing of reforms. Finally, the convergence among member states is a secondary effect of new member states adapting to the existing standard of protection and is not reflected in the existing member states. In addition to the international level, the literature has also identified the US and its actions as a converging force. The US did not join the Berne Convention until 1988 and instead established an alternative international agreement that matched its preferences for constitutive formalities: the 1951 Uniform Commercial Code (UCC). The data indicates an overall convergence at this time point (0.9 to 0.4) between the US and the international level. Overall, the UCC changed the nature of the international level as its score fell from 3.7 to 3.1 between 1950 and 1960, while the US score remained stable at 2. The differences in the “Formalities” and “Protection of Foreigners” dimensions fell between 1950 and 1960: 4 to 1.5 and 3 to 0.6. Therefore, the UCC was a reflection of US preferences and influenced the international level in this respect. In conclusion, the US influenced the international level by shaping the UCC to meet its preferences. However, this is the only instance of US influence on any country analysed in the case studies. None of the other convergences can be directly attributed to the US. However, it should be noted that both Germany and the UK were always least likely case studies for US influence. Both countries possessed mature copyright laws in 1880 and are economically strong in their right. In addition, the UK and Germany have always advocated international protection as is reflected in their active role in the Berne Convention. Therefore, many of the US’ routes of influence, including bilateral pressure and model laws, do not affect either country. A similar limited influence can be identified for the EU. When the cultural scores are calculated for the EU, the results indicate that it forms a mid-way house between the UK and Germany. First, it is noticeable that the EU did not cause a convergence with Germany. Germany and the EU became more similar as the difference between them declined from 0.9 to 0.6 between 2000 and 2010. However, none of Germany’s changes can be linked to either the EU or German influence on the EU. The maximum impact the EU had is observable in relation to the UK where it explains a parallel movement between the two. The distance remained at 0.8 as both moved towards AR (from 2.5 to 2.7 (UK) and 3.3. to 2.5 (EU)). The data suggests that the EU had an influence on the originality levels in the UK where it rose 1 to 2, reducing the distance between them from 2 to 1. It also affected the number of moral rights, as it required its member states to introduce a resale right. However, other dimensions have seen major divergences and these cannot be attributed to the EU. Most notably, the contract-ability dimension which describes here the extent to which copyright provisions are subject to contractual limitations protecting the author strongly diverged (from 0.1 to 1.3) and the UK’s amendments to contractual safeguards cannot be linked to the EU. In conclusion, although the EU had some influence on the UK, its role as a converging force on its member states examined here is very limited. Given the existing literature on copyright and the importance of convergence in the discussions, it was unclear why the responses to recent challenges like the digitisation of books and the online environment varied so significantly. The findings of this article go some way in explaining this. The analysis has demonstrated that the actual degree of convergence has been significantly more limited than previously argued. This means that the expectation of growing similarity in response to shared challenges has also been overstated because significant variation remains in how copyright is understood. This article has provided a way to conceptualise the difference between copyright systems in a coherent manner. It distinguished between CL and AR systems, which differ on the basis of how they understand the purpose of copyright. It established a system to measure such differences and can be used to clarify the degree of convergence rather than just assert its presence. It combines the detailed view of positions taken on particular issues without losing track of the larger picture. By doing so, it provides a way to contribute to the on-going debates about the extent of copyright convergence. The empirical results have shown that the extent of convergence was limited. Although the overall positions do show convergence, this hides that significant variation remains. Each of the eleven dimensions, which together make up the ideal type AR and CL systems, refer to a particular issue. The results have shown that the case studies continue to vary in how they position themselves on these issues. In sum, the differences between dimensions continue to be significant and have seen less convergence than the growing similarity that the overall cultural scores suggest. As a result, it should have been expected that responses to a fundamental challenge like the Google Books project, and the resulting digitalisation of books, would vary. The initiative undertaken to digitise works without the consent of the copyright owners, and the extent to which the books are made available online, continues to differ because the basic understanding of what and how copyright should work also continues to vary, despite similar copyright components on the surface. As a result, it was arguably a misconception about the degree of convergence that has created the unwarranted expectation that responses to new technological challenges should be met with similar responses. The differences between the empirical pattern and the expected result are probably influenced by the gaps identified here in the causal explanations for convergence. First of all, technological developments have not contributed to convergence in the understanding of copyright, as the introduction of NR has demonstrated. Furthermore, the impact of international harmonisation is uneven. Minimum harmonisation is only effective if it prohibits provisions and therefore requires active legislative change for compliance, for example by abolishing formalities. On the other hand, if it requires protection to be added, then more variation is possible. This was the case with MR in the Berne Convention. Convergence was also not achieved as a result of US pressure. The US’ unilateral influence is only evident here in respect to the international level, after the 1951 ratification of the UCC. There is little evidence that this impacted the other case studies independently. However, it should be noted that the countries selected for the case studies, were always very unlikely cases. Therefore, a study covering a broader range of countries is necessary to fully examine this kind of attraction. Similarly, the influence of the EU is limited to a parallel movement with the UK and had no measurable effect on Germany. The amendments it required were too narrow to cause a convergence with the UK. The main point highlighted by recent technological challenges to copyright is that we are missing part of the copyright story. More importantly, something else must have shaped the evolution and more research is necessary to fill this gap. The literature on policy convergence has generally identified a number of different mechanisms that can facilitate or hinder the convergence of copyright policies. These include market specifics, the nature of government and domestic institutions but also the distributive effect of the policy in question; these can all have a limiting effect on convergence. The limits of long-term convergence, despite strong domestic and international pressures, needs to be explained and merits further investigation, from a more cross-disciplinary approach. Table 5: Convergence scores for the individual dimensions and the overall result for Germany, the US, the UK, the EU and the international level. * Simone Schroff is a PhD student at the University of East Anglia. The author would like to thank Professor Morten Hviid, Professor Christopher Wadlow, Dr Daithí Mac Síthigh and Dr Chris Hanretty, as well as the SCRIPTed reviewers, for their support and feedback. In addition, the author thanks Miss A Kreutzmann-Gallasch and M Subalova for help on an earlier version of this article. Any remaining errors are the author’s own. S von Lewinski, International Copyright Law and Policy (Oxford: OUP, 2008). C Seville, The Internationalisation of Copyright Law – Books, Buccaneers and the Black Flag in the Nineteenth Century (Cambridge: CUP, 2006); J Braithwaite and P Drahos, Global Business Regulation (Cambridge: CUP, 2000), at 67-69; S von Lewinski, International Copyright Law and Policy, at 26- 29. Other major agreements include the 1951 Universal Copyright Convention, 1961 Rome Convention and the 1996 World Intellectual Property Organisation Copyright Treaty (WCT). S Ricketson, The Berne Convention for the Protection of Literature and Artistic Works: 1886-1986 (London: Kluwer, 1987); S Ricketson and J Ginsburg, International Copyright and Neighbouring Rights – The Berne Convention and Beyond (Oxford: OUP, 2006). H MacQueen et al, Contemporary Intellectual Property – Law and Policy (Oxford: OUP, 2008); S von Lewinski, International Copyright Law and Policy, at 4-12. G Davies, Copyright and the Public Interest 2nd ed (London: Sweet & Maxwell, 2002); P Goldstein, Copyright’s Highway – From Gutenberg to the Celestial Jukebox (Stanford: Stanford University Press, 2003); P Goldstein and P Hugenholtz, International Copyright – Principles, Law, and Practice 2nd ed (Oxford: OUP, 2010); G Davies, "The Convergence of Copyright and Author’s Rights – Reality or Chimera?" (1995) 26 International Review of Intellectual Property and Competition Law 964-980. L Bently and B Sherman, Intellectual Property Law 2nd ed (Oxford: OUP, 2004). S Stokes, Art and Copyright (Oxford: Hart Publishing, 2003), at 22. J Braithwaite and P Drahos, see note 2 above. S von Lewinski, see note 1 above; G Davies, Copyright and the Public Interest, see note 6 above. G Davies, Copyright and the Public Interest, see note 6 above, at 339- 341. Copyright has over time included new kinds of works such as phonograms, sound recordings, broadcasts and photos among others. K Holzinger and C Knill, "Causes and Conditions of Cross-National Policy Convergence" (2005) 12 Journal of European Public Policy 775-796; C Bennett, "What is Policy Convergence and What Causes it?" (1991) 21 British Journal of Political Science 215-233, at 22; P Busch and H Jörgens, "The International Sources of Policy Convergence: Explaining the Spread of Environmental Policy Innovations" (2005) 12 Journal of European Public Policy 860-884; A Lenschow et al, "When the Birds Sing. A Framework for Analysing Domestic Factors Behind Policy Convergence" (2005) 12 Journal of European Public Policy 797-816. See for example on the spread of moral rights: P Goldstein and P Hugenholtz, see note 6 above, at 15 and 21; G Davies, Copyright and the Public Interest, see note 6 above, at 345-346; G Davies and K Garnett, Moral Rights (London: Sweet and Maxwell, 2001), at 103. For convergence in originality levels, see: J Drexl, What is Protected in a Computer Program? Copyright Protection in the United States and Europe (Weinheim: Wiley-VCH, 1994), at 103. Compare for example J Kim, "International Convergence of Copyright Production" (2011) 93 The Review of Economics and Statistics 1432-1439 or W Landes and R Posner The Economic Structure of Intellectual Property Law (Cambridge, MA: Harvard University Press, 2003) with E Adeney, The Moral Rights of Authors and Performers: an International Comparative Analysis (Oxford: OUP, 2006). S von Lewinski, see note 1 above, at 3; J Sterling, World Copyright Law – Protection of Author’s Works, Performances, Phonograms, Films, Video, Broadcasts and Published Editions in National, International and Regional Law (London: Sweet & Maxwell, 2003); P Goldstein and P Hugenholtz, see note 6 above, at 15; G Davies and K Garnett, see note 14 above. H MacQueen et al, see note 5 above; F Grosheide, "Paradigms in Copyright Law" in B Sherman and A Strowel (eds) Of Authors and Origins – Essays on Copyright Law (Oxford: OUP, 1994) 203-233, at 204; S von Lewinski, see note 1 above, at 63. S von Lewinski, see note 1 above; G Davies, Copyright and the Public Interest, see note 6 above; S Larsson, "The Path Dependence of European Copyright" (2011) 8 SCRIPTed 8-31, at 10; T Aplin, "United Kingdom" in B Lindner and T Shapiro (eds), Copyright in the Information Society – A Guide to the Implementation of the European Directive (Cheltenham: Edward Elgar, 2011), at 577. J Sterling, see note 16 above. P Goldstein and P Hugenholtz, see note 6 above; G Davies and K Garnett, see note 14 above. The issue affects all countries. For a large selection of international press coverage on the issue, see:; For an influential German view on the issue: D Zeit, Schlagwort: Google Books (2013) available at http://www.zeit.de/schlagworte/themen/google-books/index (accessed 1 May 2013); Discussions have also occurred at the EU level: European Commission, "It is time for Europe to Turn over a New e-Leaf on Digital Books and Copyright" (2009) available at http://europa.eu/rapid/press-release_MEMO-09-376_en.htm (accessed 11 March 2013); E Miller, "What is Europe’s Answer to Google Books" (2009) 56 Single Market News, at 18. Other examples of countries’ varying reactions to technological challenges can be seen in the mechanical instruments of the early 20th century and the home recording of the 1980s. For a detailed account on these, see B Kernfeld, Pop Song Piracy – Disobedient Music Distribution Since 1929 (London: University of Chicago Press, 2011). M Barnier “Making European Copyright Fit for Purpose in the Age of the Internet” (2012) available at http://europa.eu/rapid/press-release_SPEECH-12-785_en.htm (accessed 4 May 13); European Commission, “Europeana – Next Steps” (2009) available at http://eur-lex.europa.eu/LexUriServ/LexUriServ.do?uri=COM:2009:0440:FIN:en:PDFh (accessed 4 May 13). European Commission, “Green Paper: Copyright in the Knowledge Society” (2008) available at http://ec.europa.eu/internal_market/copyright/docs/copyright-infso/greenpaper_en.pdf (accessed 4 May 13); European Commission, see note 22 above. J Ginsburg, "A Tale of Two Copyrights: Literary Property in Revolutionary France and America" (1990) 64 Tulane Law Review, 991-1031. For a detailed description of the ideal type, please see section 2. S Ricketson and J Ginsburg, see note 4 above, at 2; J Braithwaite and P Drahos, see note 2 above, at 4; J Barnes, Authors, Publishers and Politicians – The Quest for an Anglo-American Copyright Agreement 1815- 1854 (London: Routledge and Kegan Paul, 1974), at 11; W Cornish, "International Relations of Intellectual Property" (1993) 52 Cambridge Law Journal 46-63; S Wang, Framing Piracy- Globalization and Film Distribution in Greater China (Oxford: Rowman and Littlefield Publishers, 2003), at 24. These are: the Berne Convention; the Universal Copyright Convention; the Rome Convention; the Phonograms Convention; TRIPs; WCT and World Intellectual Property Organisation (WIPO) Performances and Phonograms Treaty (WPPT). This means in practice that the individual treaties (see note 27) were compared at each point in time and the strongest provisions in each area were selected and then combined into a single case study. This approach has the benefit of providing a clear pool of sources and therefore ensures comparability in their selection across the case studies. In addition, it stays as close as possible to the official consensus and its interpretation given that legislation is passed by a majority vote in parliament and judges orient themselves on this. However, this narrow selection also means that some aspects, which determine how copyright actually affects users, are not included. For example, because it focuses on the legislation itself, contractual provisions commonly used today to restrict user actions (for example EULAs) are excluded. As a result, the concept of copyright presented here is more static than it may be in practice. For example, see C Bennett, "What is Policy Convergence and What Causes it?" (1991) 21 British Journal of Political Science 215-233; P Busch and H Jörgens, see note 13 above; S Heichel et al, "Is There Convergence In Convergence Research? An Overview Of Empirical Studies On Policy Convergence" (2005) 12 Journal of European Public Policy 817-840; A Lenschow et al, see note 13 above; M Siems, "Convergence in Corporate Governance: A Leximetric Approach" (2010) 35 Journal of Corporation Law 729-759. C Bennett, see note 28 above; K Holzinger and C Knill, see note 13 above, at 776. S Heichel et al, see note 28 above, at 829. R Seeliger, "Conceptualizing and Researching Policy Convergence" (1996) 24 Policy Studies Journal 287-306. For description of how these indicators relate to the methodology, please see section 2.2, especially p. 10. For a complete list of all indicators, please refer to the Table 2. J Ginsburg, see note 24 above. G Davies, Copyright and the Public Interest, see note 6 above; R Deazley, On the Origin of the Right to Copy – Chartering the Movement of Copyright Law in 18th Century Britain (1695- 1775) (Oxford: OUP, 2004); M Rose, Authors and Owners – The Invention of Copyright (London: Harvard University Press, 1993). S von Lewinski, see note 1 above. G Davies, "The Convergence of Copyright and Author’s Rights- Reality or Chimera? ", see note 6 above; G Davies, Copyright and the Public Interest, see note 6 above; R Monta, "The Concept of "Copyright" versus the "Droit D’ Auteur" (1958) 32 Southern California Law Review 177-186; S von Lewinski, see note 1 above. H MacQueen et al, see note 5 above; G Davies, Copyright and the Public Interest, see note 6 above. S von Lewinski, see note 1 above, at 43. G Davies, Copyright and the Public Interest, see note 6 above; H MacQueen et al, see note 5 above; J Ginsburg, see note 24 above; C Seville, "Nineteenth-Century Anglo-US Copyright Relations: the Language of Piracy Versus the Moral High Ground" in L Bently, J Davis and J Ginsburg (eds) Copyright and Piracy: An Interdisciplinary Critique (Cambridge: CUP, 2010), at 19-43; R Monta, see note 35 above; S von Lewinski, see note 1 above. G Davies, Copyright and the Public Interest, see note 6 above; H MacQueen et al, see note 5 above; C Seville, see note 38 above. G Davies, "The Convergence of Copyright and Author’s Rights- Reality or Chimera? ", see note 6 above; P Goldstein, see note 6 above; R Monta, see note 35 above. G Davies, "The Convergence of Copyright and Author’s Rights- Reality or Chimera? ", see note 6 above; J Ginsburg, see note 24 above; S von Lewinski, see note 1 above. J Ginsburg, see note 24 above; P Goldstein, see note 6 above; R Monta, see note 35 above. S von Lewinski, see note 1 above, at 53. For a complete list of indicators and the specific dimension they are used in, please refer to Table 2. A detailed summary of the coding scheme for each of these eleven dimensions is available on request from the author. For a summary of these ideal types, please see section of 2.2 The Structure of Copyright Policy. K Holzinger and C Knill, see note 13 above, at 776. The complete data set can be found in the Appendix. Generally, any move larger than 0.2 overall and 1 at the individual level qualifies as a strong shift. The individual level refers to one of eleven dimensions, which make up the overall convergence score. The underlying values of the case studies do vary systematically as AR types are expected to have higher scores than CL ones. To ensure that values are directly comparable, this variation has to be controlled for. International Copyright Act (Chace Act) 1891. P Goldstein and P Hugenholtz, see note 6 above; D Drezner, "Globalization and Policy Convergence" (2001) 3 International Studies Review, 53-78; A Lenschow et al, see note 13 above. P Goldstein and P Hugenholtz, see note 6 above. J Drexl, see note 14, at 10; P Goldstein and P Hugenholtz, see note 6 above, at 21. By placing the values for particular indicators on the five-step spectrum, according to the maximum value in the sample, incremental changes such as rising number of work types are controlled for. This means that adding a particular work type, like computer programs, is unlikely to have a systematic cultural effect. At this stage, the international level only consists of the Berne Convention. W Kingston, “Intellectual Property’s Problems: How Far is the US Constitution to Blame?” (2002) 4 Intellectual Property Quarterly 315- 341, at 333- 334. It should be noted that the literature does not explicitly refer to the dimension distinction used here, but instead argues that the case studies have become more similar overall. This means that only those instances where the overall culture scores have moved closer to each other are relevant here. Where they persist, only national works would be subject to them, giving an impression of favouring foreign over national authors. This tends to be unacceptable, especially since copyright owners favour automatic protection in all circumstances. C Seville, see note 2 above, at 9. Royal Commission, “Report of the Royal Commission” (1878). C Seville, see note 2 above, at 37. G Davies, Copyright and the Public Interest, see note 6 above, at 336. P Goldstein and P Hugenholtz, see note 6 above at 28. J Braithwaite and P Drahos, Global Business Regulation, at 66; W Cornish and D Llewelyn, Intellectual Property: Patents, Copyright, Trade Marks and Allied Rights (London: Sweet & Maxwell, 2007, 6th ed. ), at 39. The results can be found in the appendix. G Davies, Copyright and the Public Interest, at 345-346. A Lenschow et al, see note 13 above; C Knill, "Introduction: Cross- National Policy Convergence: Concepts, Approaches and Explanatory Factors" (2005) 12 Journal of European Public Policy 764-774; P Humphreys and S Simpson, "Globalization, the “Competition” State and the Rise of the “Regulatory’” State in European Telecommunications" (2008) 46 Journal of Common Market Studies 849-874. A Lenschow et al, see note 13 above; C Knill, “Introduction: Cross- National Policy Convergence: Concepts, Approaches and Explanatory Factors” (2005) 12 Journal of European Public Policy 764-774; P Humphreys and S Simpson, “Globalization, the “Competition” State and the Rise of the “Regulatory’” State in European Telecommunications” (2008) 46 Journal of Common Market Studies 849-874.